Sudan is widely recognized as an authoritarian state where all effective political power is obtained by President Omar al-Bashir*(shown on the left) and the ruling National Congress Party (NCP). The political system of the country was restructured following a military coup on 30 June 1989, when al-Bashir led a group of officers and overthrew the government of Prime Minister Sadiq al-Mahdi. 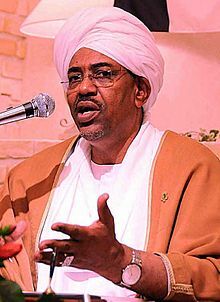 Under al-Bashir’s leadership, the new military government suspended political parties and introduced an Islamic legal code on the national level. Despite his international arrest warrant, al-Bashir was a candidate in the 2010 Sudanese presidential election, the first democratic election with multiple political parties participating in twenty-four years. A few days before the vote, Yasir Arman from the SPLM, withdrew from the race. The U.S.-based Carter Center, which monitored the elections, described the vote tabulation process as “highly chaotic, non-transparent and vulnerable to electoral manipulation.” Al-Bashir was declared the winner of the election with sixty-eight percent of the vote. There was concern among the international community of a return to violence in the run-up to the January 2011 southern Sudan referendum, with post-referendum issues such as oil-revenue sharing and border demarcation not yet resolved. In the Sudan, the western influence is represented by the complex administrative bureaucracy of Sudan’s Condominium government, the missionary schools in the South, the establishment of Gordon Memorial College in Khartoum, and various other social institutions.The Islamic sector of Sudan took the formation of social institutions as developed specifically for the purpose of fostering the growth of an Islamic elite. The establishment and increasing influence of traditional Islamic schools and institutes such as the Islamic African Center of Khartoum, formed in 1977 by the government to offer African societies an alternative model of modernization to the Western model, was seen as a way to counteract the pervasive Western influence. The center’s aim was to combat negative perceptions of Islam, and to reverse the work of the European imperialists and Christian missionaries through the development of an Islamic educated elite. According to the 2011 Annual Report of the Observatory for the Protection of Human Rights Defenders, in 2010–2011, in the lead up to Southern Sudan’s independence, repression intensified against all dissenting voices, largely conducted by the National Intelligence and Security Services (NISS). As in previous years, crackdown on human rights activists continued, and humanitarian workers working in that region were subjected to further attacks and restrictions on freedom of movement. Journalists reporting on human rights violations also faced censorship and harassment. Human rights defenders promoting fair, transparent and free electoral processes and a number of women’s rights defenders were also targeted.